Countless striking and colorful modern designs for flower-vases are suggested by the various cylinder-shapes and colors in which plastics are available. In many cases, a plain polished cylinder with a sheet bottom cemented in, makes a satisfactory design. Other suggestions are contained in the sketch, Figure 54. The first, upper left is a #2CP cylinder, 1 1/2" outside diameter, forming an attractive bud-vase. The two rings, of the same or a contrasting color, are turned from sheet and cemented. The sceond design to the right of this is a variation of the same idea. The third is an interesting variation, with a #6 cylinder (3" dia., 6 1/4i" high) having two grooves turned on the lathe, and a design scratched or carved in, and "inlaid" with black lacquer. 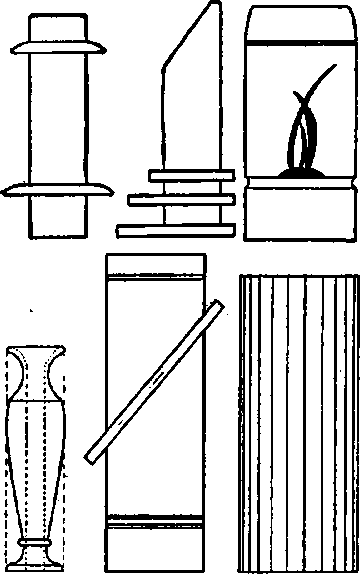 The lower row, a #1CP cylinder, having walls nearly a half-inch thick, is turned to a Grecian bud-vase design; the second is a tall #5 cylinder 8 1/2" tall, outside diameter, with lathe-turned grooves and a diagonal sheet ring (or a ring sawed from cylinder stock as described in Project No. 39, and the last sketch is a plain #7 cylinder, which is scalloped, forming ornamentation enough in its natural state. A few suggestions for colorful attractive flower-vases made up from stock sizes of cylinders. Countless variations in contour and design will also suggest themselves in making up various types of turned boxes from cylinder-stock. 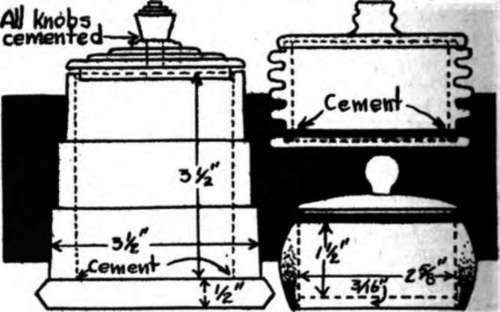 Different types of cylinders come in wall-thicknesses varying from 1/4" to 1/2", the latter thickness of wall being sufficient to permit considerable variation in diameter in a box three inches or so high. The thinner cylinders of course will permit less deep turning, but a variety of beads, coves and grooves can be cut in them nevertheless, provided they are mounted perfectly concentric on a mandrel; if they are off-center even a small amount, anything but a shallow cut would go thru on the shallow side, and moreover the entire surface would have to be turned down in order to get an even groove. Suggested contours are shetched in Figure 55, using the #3 or thick-walled cylinder as well as the thinner cylinders. Other turned-box designs will be found in Plate 4-1. Fig. 55. Three design, for turned boxes. Project 41.